The south jetty at the Hammond Boat Basin is a good place to go diving if you’re in the general Astoria area and are interested in doing a little underwater hunting. There is decent crabbing and spear fishing here. The north and east sides of the jetty are exposed to the full force of the Columbia River where the current can really rip. While the water is shallow near the base of the jetty, head north and things suddenly get deeper as you approach the main shipping channel. The south jetty at Hammond Boat Basin is a good place to go crabbing and spearfishing. Hammond, Oregon is just south of the Hammond Boat Basin South Jetty. Head north on Iredale Street from downtown Hammond. Just past 5th Avenue there are some dirt tracks taking off to the right (east). These go down to the beach. Where Iredale Street turns west there is a pull-out. Most divers will probably park at the pull-out where Iredale Street turns west. Some people also park down on the beach by the entrance/exit. The dive site at Hammond Boat Basin south jetty runs north-south along the jetty. If you stray too far north or east from the jetty, you’ll end up in the shipping lanes and in an area with a LOT of current. The easiest entrance/exit is at the beach on the east side of the base of the Hammond Boat Basin south jetty. It’s a nice walk in and out. On the west side of the jetty, there aren’t many good places to get in and out but you can do it in a pinch. Depending on the tidal flows, this is either a salt or a brackish dive. Hammond Boat Basin south jetty is a shore dive. You will likely encounter current on the east side of the jetty. The full force of the Columbia River roars through here. Occasional big waves come through the area that could cause some surge and surf as big ships pass. Depending on ocean conditions, river conditions, and the tide, you might get up to 10 feet of viz but usually it’s less. Expect between 45 and 55F water. Fall is a good time to check this dive site out although it’s accessible any time of the year. Along the jetty at high tide you will find 10-15 feet of water. If you head north or east away from the jetty, the shipping channel drops to 50 feet or more. 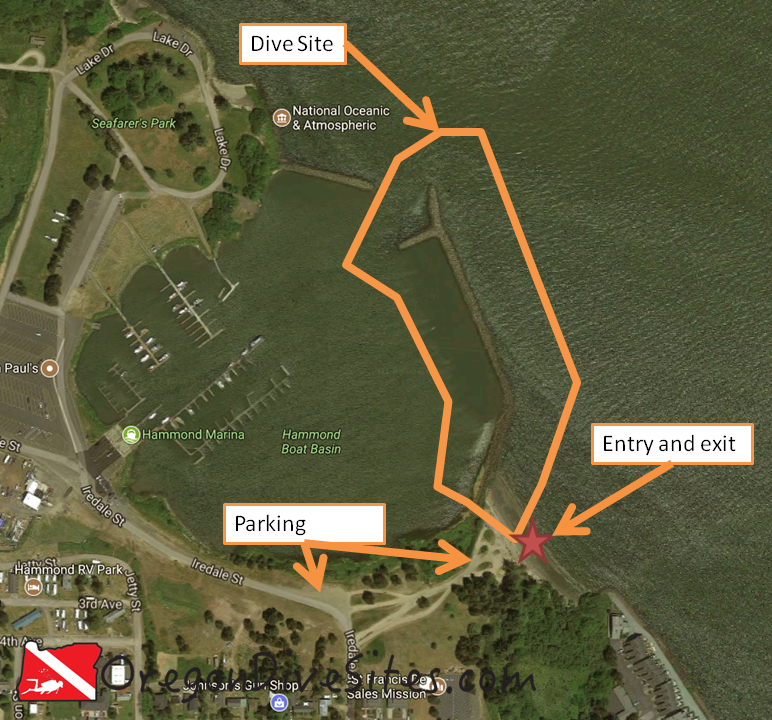 Advanced open water training is a good idea to dive the Hammond Boat Basin south jetty. Experience with diving in a high current area is also a good idea. We rate this as an intermediate dive because of the current and potential for low viz. Depending on where you park, 20 to 300 feet of walking is in your future. No surface swim is needed. Remember that the Columbia River has a roaring current during tide changes. Be prepared for that. Also viz can be very low here. Be mindful of fishermen on the jetty and stay out of their fishing lines. Astoria has a full service SCUBA shop. We keep an updated list of dive shops and air fill stations at our Local Dive Shops page. There are some good places to eat in Astoria. We like the fish and chips place that operates out of an old boat in downtown. There are many campgrounds in the general area that have yurts, tent sites, and RV sites. All are SCUBA diver friendly. We haven’t tried any of the hotels around here so please let us know if there is one in particular that you know to be diver-friendly!